The positive sodium ion and the negative chloride ion are strongly attracted to each other. 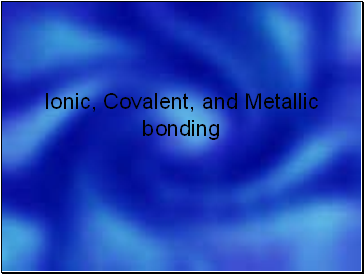 This attraction, which holds the ions close together, is a type of chemical bond called an ionic bond. 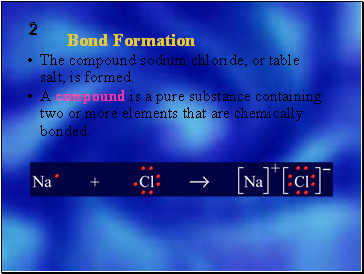 The compound sodium chloride, or table salt, is formed. A compound is a pure substance containing two or more elements that are chemically bonded. Can elements lose or gain more than one electron? 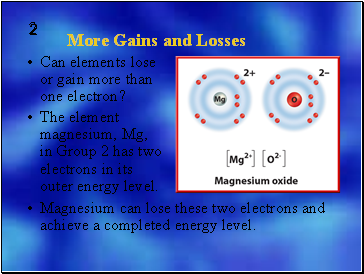 The element magnesium, Mg, in Group 2 has two electrons in its outer energy level. Magnesium can lose these two electrons and achieve a completed energy level. Some atoms, such as oxygen, need to gain two electrons to achieve stability. The two electrons released by one magnesium atom could be gained by a single atom of oxygen. When this happens, magnesium oxide (MgO) is formed. Some atoms are unlikely to lose or gain electrons because the number of electrons in their outer levels makes this difficult. The alternative is sharing electrons. 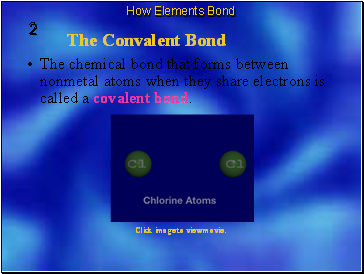 The chemical bond that forms between nonmetal atoms when they share electrons is called a covalent bond. 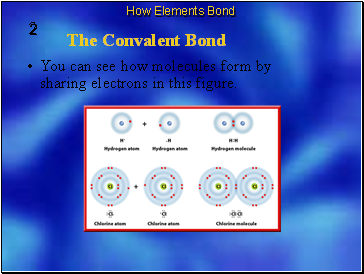 Shared electrons are attracted to the nuclei of both atoms. They move back and forth between the outer energy levels of each atom in the covalent bond. So, each atom has a stable outer energy level some of the time. A molecule is the basic unit of a molecular compound.